The Cottage is a dainty, detached cottage located on the outskirts of Newport, a charming harbour town on the shores of Clew Bay in County Mayo and can sleep four people. This all ground floor cottage has two double bedrooms, a shower room, a kitchen with a dining area and a sitting room with an open fire. Outside there is off road parking for three cars and a lawned garden to the rear. The Cottage is a wonderful location for your Irish holiday. Newport is a small, picturesque harbour village, set on the shores of Clew Bay in County Mayo. Situated just north of Westport, Clew Bay is well known for its water activities and sea angling. 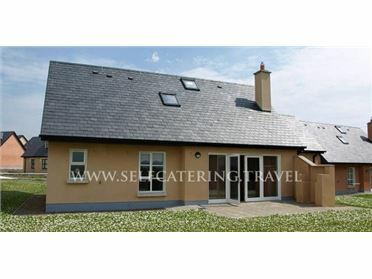 This is a wonderful village location for your holiday in County Mayo. Electric central heating with open fire. Electric oven and hob, microwave, fridge, washing machine, TV with Free-to-air channels, DVD, selection of books, games and DVDs. Fuel, power and starter pack for fire inc. in rent. Bed linen and towels inc. in rent. Off road parking for 3 cars. Lawned garden. Sorry, no pets and no smoking. Shop and pub 3 miles. Beach 6 miles..